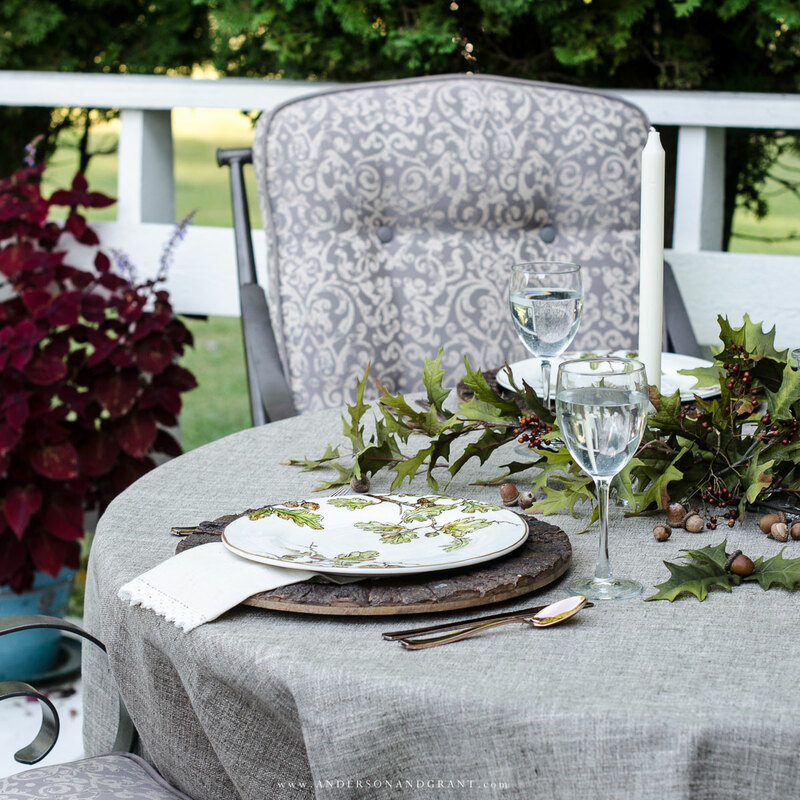 Today I'm joining in with a group of friends to share our ideas for creating fall tablescapes and inspire you to create something on your own. 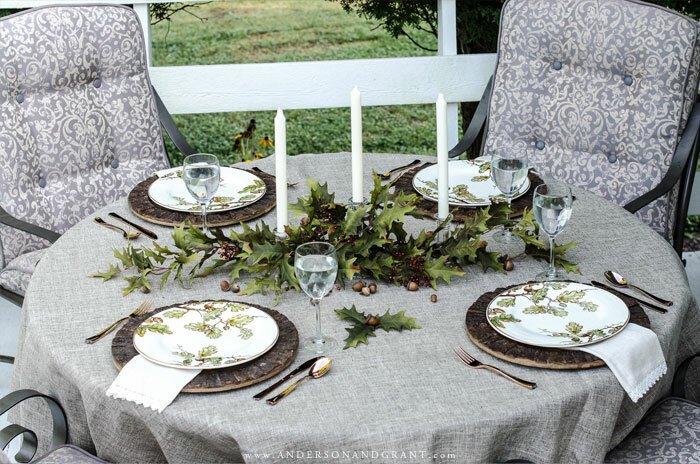 At the end of this post you'll find links to many more bloggers who will no doubt give you plenty of suggestions for designing a special fall table at your own home. Whether it is a casual dinner or entertaining with a large group, my goal is always to keep it simple. And that is especially true when the meal will be served outdoors. There is no need to spend a lot of time setting up something elaborate when your goal should be spending time with those sitting around your table. 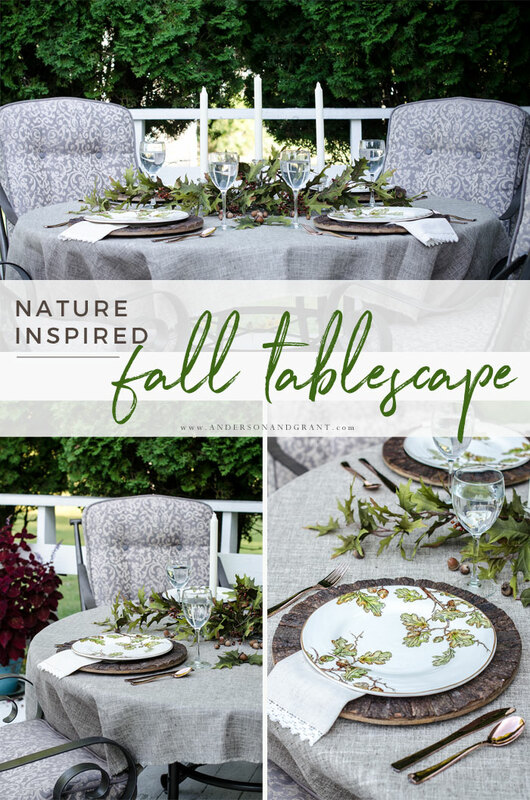 When the fall season is your inspiration, nature provides you with everything you need to decorate your home and your table. Organic elements like leaves and pumpkins paired with the colors found outdoors provide an easy place to start if need a few ideas. 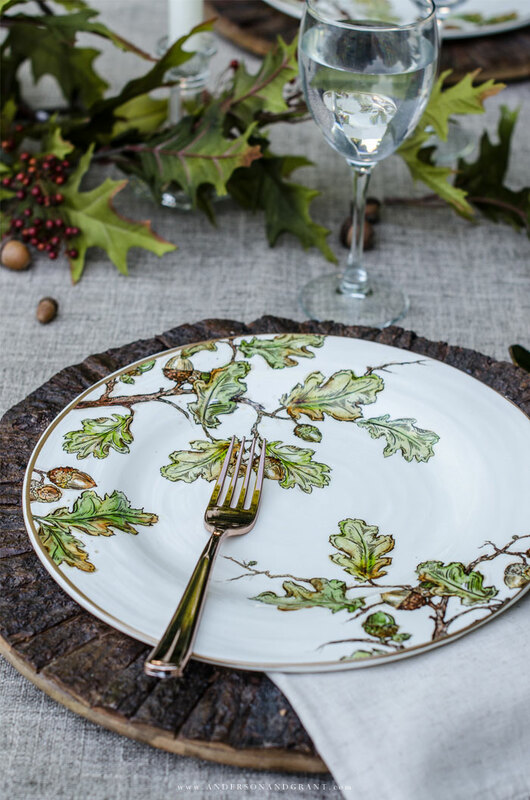 A few years ago, I picked up these beautiful oak leaf plates at Pier1 Imports and I think they serve as a great focal point to design my table around. They've shown up in a tablescape here before, but serve as a good example of how different an entire table can look based on what you pair the focal point with. It is always helpful to pick one item as a starting point when designing a tablescape and then all of your decisions can be made to enhance what you want to show off. In this case, the dinnerware inspired choices about my centerpiece, color palette, and what to pair with the dishes in terms of the chargers and flatware. 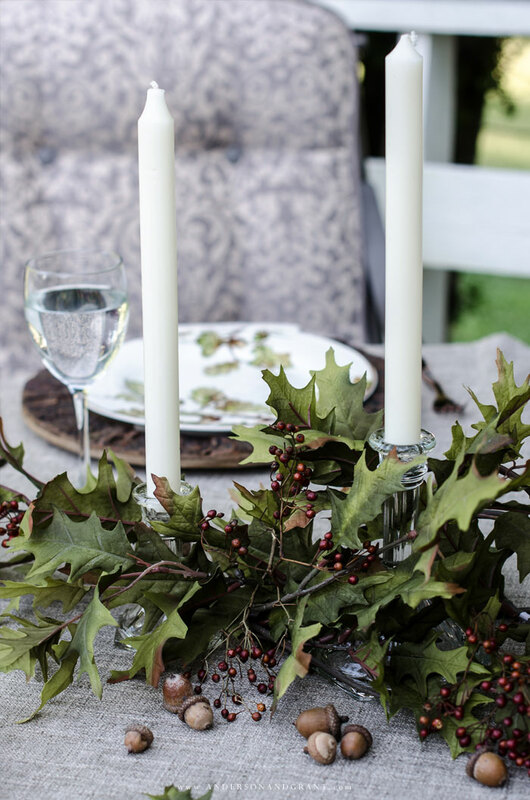 Drawing on the oak leaf theme, I put together a simple centerpiece of white taper candles, green oak leaves (also purchased from Pier1 last year), berries, and a sprinkle of acorns gathered from alongside the road in my neighborhood. Because the plates have the green leaves, I didn't want to introduce any other colors that would take away from them. 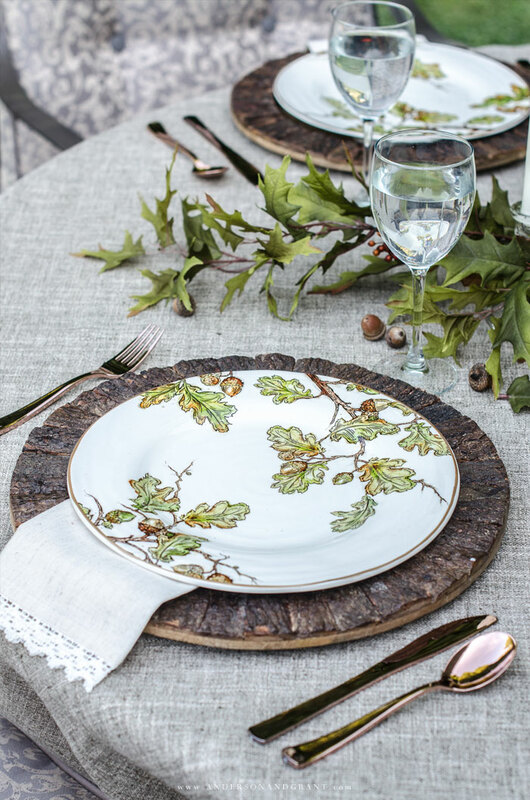 The plates are resting on rustic wood chargers which enhance the natural look of the tablescape and reinforce the idea of a "tree" theme. And I love how the copper colored silverware plays against the browns and oranges in the dishes. 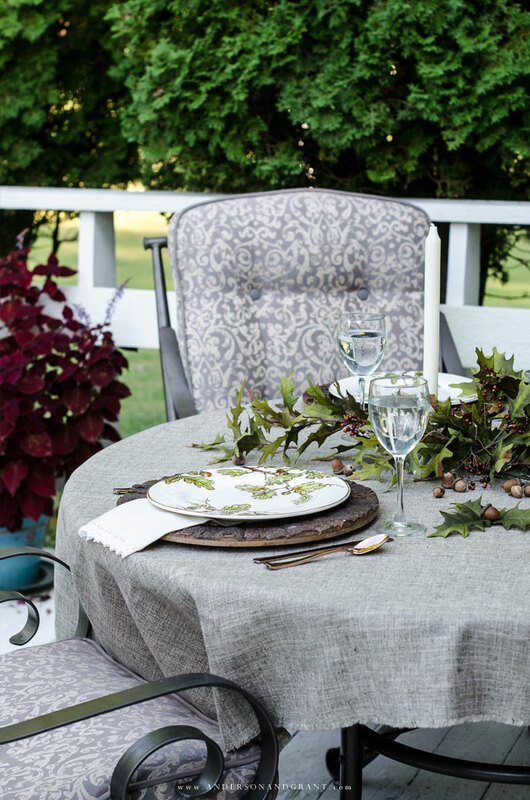 Finally, the neutral colored tablecloth has a lot of texture to it which provides an interesting backdrop, yet also allows everything placed on top to shine. Rather than competing with the elements, it enhances how everything looks together. 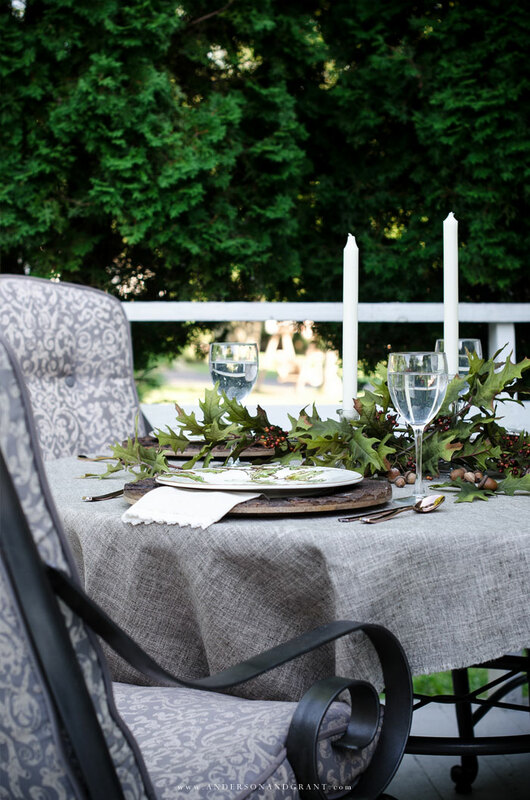 Well, I hope this post inspired you to set up a simple table outside this fall where you can enjoy dinner in the cooler air. 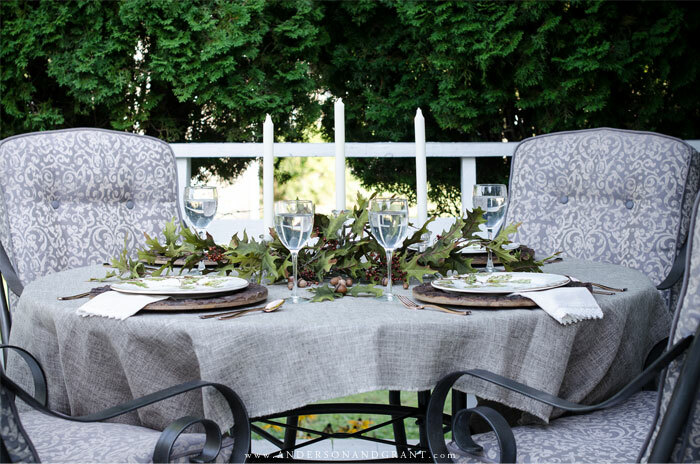 Look around your own home to find something that can serve as a jumping off point for creating a cohesive look with your dinnerware and centerpiece. And remember to keep whatever you do simple allowing you to savor your time with friends and family. 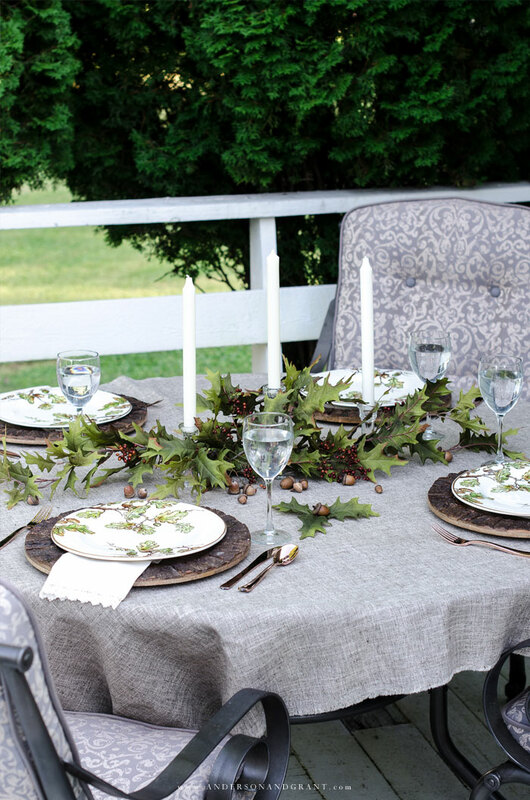 My friends have also put together stylish ideas for setting a beautiful table this fall. Be sure to visit a few of these blogs shown below for more inspiration!